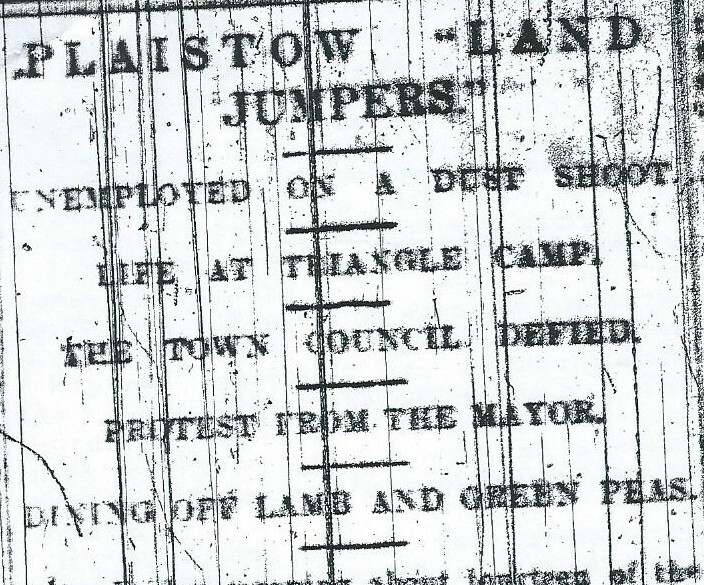 This is the first of a two-part post on a remarkable piece of direct action taken in the early years of the twentieth century by "The Plaistow Land Grabbers" to address the serious issue of unemployment in the borough of West Ham. The second part, to follow, looks at activities inspired by the Land Grabbers, at the time and subsequently. Their actions are largely forgotten today, but were an important chapter in the life of the developing and radical borough of West Ham. These two posts are the culmination of a number of pieces of research undertaken by this site and contributors, Mark Gorman and Peter Williams and the active participation of modern day public space cultivators, such as the Abbey Gardens collective in Stratford and allotmenteers, Kevin and Elaine Fieldhouse, who currently tend some of the land taken over 110 years ago by the Land Grabbers. West Ham had Britain's fastest growing population as the twentieth century dawned, and had already gained a reputation for political radicalism. The borough included the constituency of the country's first socialist/labour MP - Kier Hardie, in 1892, and hosted the country's first socialist/labour local authority, for twelve months, six years later. That was the backdrop to a dramatic piece of direct action taken by local unemployed people, in the borough, within a decade. 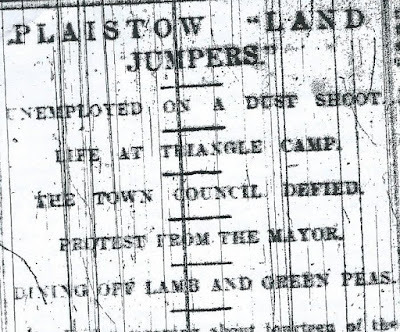 This, is the story of the Plaistow Land Grabbers. 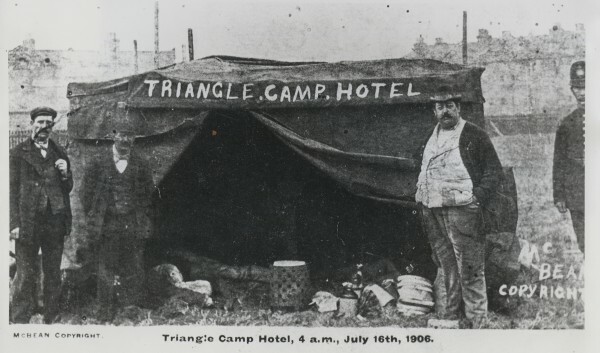 in the triangle Camp, July 1906. "Captain"
Cllr Ben Cunningham, front, far left. Bill King, third from right. There was a surge of unemployment in Britain in 1902, following demobilisation from the Boer War and the heavily industrialised and intensely populated borough was badly hit. 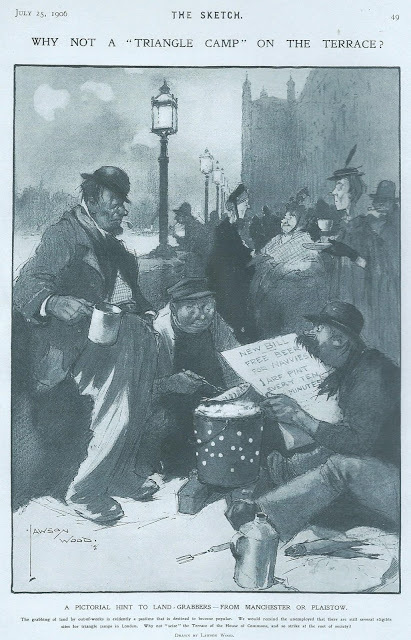 The local Marxist Social Democratic Federation (SDF)actively began to campaign, door-to-door, against unemployment in the southern part of the borough - principally around Canning Town - by 1904. Open air meetings were held in The Grove, Stratford and in the Town Hall, addressed by, among others, the SDF leader, Henry Hyndman. 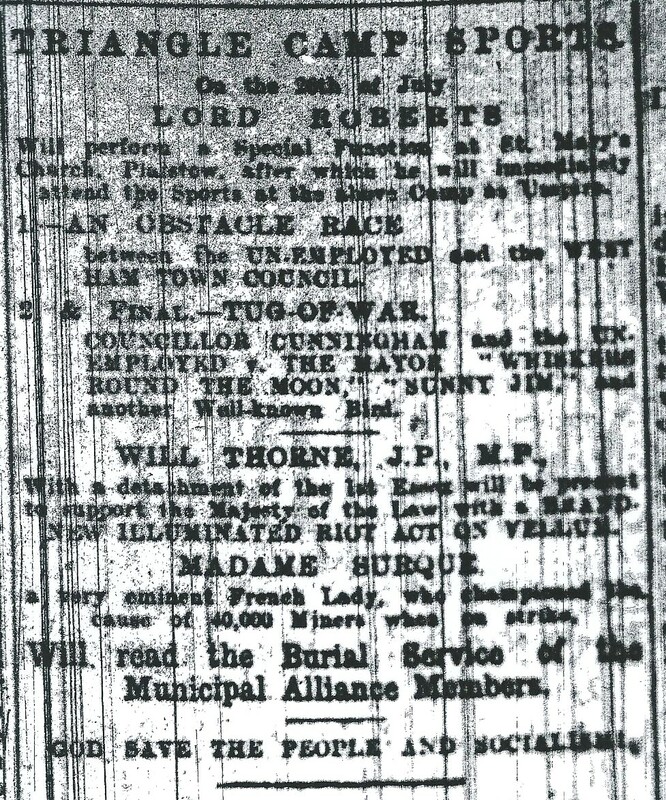 Meanwhile, local anarchists - Charles Mowbray (see here for details), among them - were agitating against unemployment in West Ham in December 1904, following the laying off of a large number of dockers, due to a protracted period of heavy fog on the river. Matters came to a head when protests against unemployment were held at local churches on Christmas Day that year, and the protestors were threatened with arrest. In an attempt to diffuse the tension, the Liberal candidate, and later MP, for the Forest Gate Parliamentary seat, CFG Masterman (see here) met with Mowbray and others at the Liverpool Street hotel. Masterman noted, in passing, that Mowbray insisted on keeping his overcoat on throughout the meeting, because he had sold or pawned his jacket because of his straightened financial circumstances. The following year Mowbray and others demanded that the, by now, Municipal Alliance (a broad-based anti- socialist group) council met to discuss unemployment locally. The council rejected the request, so a meeting of 1,500 was organised inside Stratford Town Hall in August 1905, where it was said that the 12,000 local unemployed would not remain docile for much longer, if steps weren't taken to alleviate their position. In October of that year, Mowbray addressed another meeting of 1,200 at Stratford Town Hall, where "songs, recitations and speeches were given." It was decided that 200 "heads of family" would march to West Ham Workhouse (located in Leytonstone) the following week, with Mowbray at its head. Mowbray said the intent was to tear down the gates and demand abolition of the Poor Law in the district and the introduction of directly employed labour by the local council. The protests fizzled out, but the Municipal Alliance-dominated council became alarmed enough to establish a local Distress Committee. This established a farm colony at South Ockendon, Essex. None of these measures, however, achieved much due, in a large part, to the high number of casual labourers, especially in the docks. It was an unhappy period for the Labour councillors, powerless after their recent electoral success. Mowbray continued to agitate on the issue of unemployment in the area and in the following year was linking up with local Independent Labour Party (ILP) councillor, Harry Baldock - husband of local suffragette leader, Minnie (see here and here) - on the issue, in Canning Town. 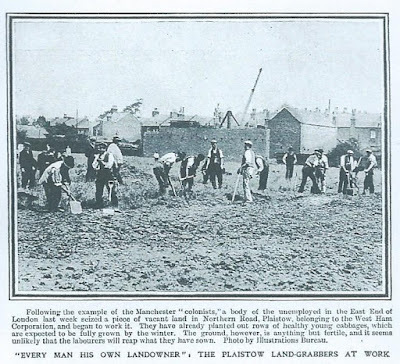 Meanwhile, SDF-lead unemployment agitation and campaigning in the north of England (Levenshulme, Bradford, Salford and Leeds)resulted in the occupation of land locally, for short periods of time, to draw attention to the plight of the jobless. 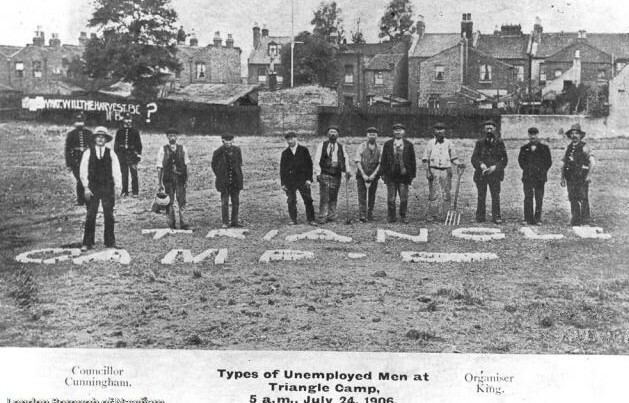 A combination of this SDF action elsewhere, and the plight and agitation of unemployed workers in West Ham, inspired a local SDF plumber and councillor, Ben Cunningham, and 14 unemployed workers to march on a piece of council-owned, vacant land of approximately three acres, just south of the railway line between Upton Park and Plaistow, on 13 July 1906 - and occupy it. are referred to as "Land Jumpers"
(According to Ancestry, Ben Cunningham seems likely to have been born in Croydon in 1860 and moved with his family to West Ham, as a young boy. He lived in Hermit Road, Canning Town, at the times of the 1891, 1901 and 1911 censuses - although in different houses: at 53, 85 and 67 respectively. 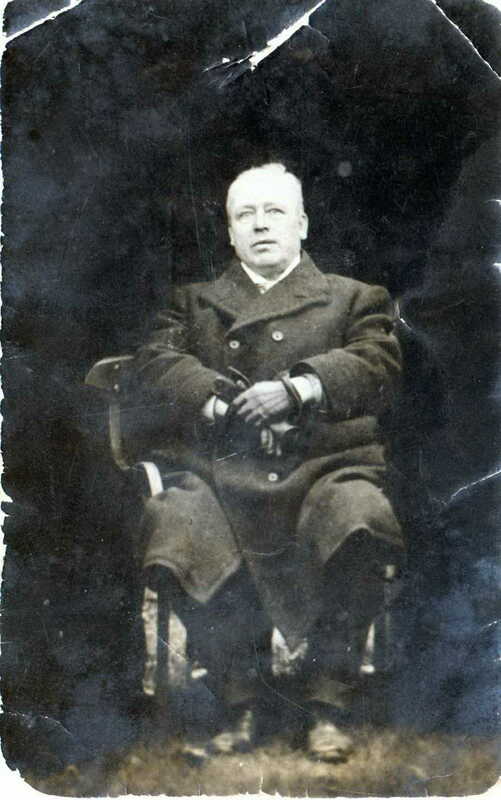 He was a self-employed plumber who had seven children and died in South East Essex in September 1937). "The plot temporarily in the hands of the out-of-works is bounded by Northern Road, St Mary's Road, Southern Road and Western Road and is commonly known as Gravel Fields or the Ballast Hole. Some twelve years ago it was accepted as a sand and gravel pit by the municipal authorities and when worked to the depth of 15ft - 20ft it was filled up with street sweepings and the like. This was completed some three or four years ago and since then it has been lying idle, although during the winter before last 500 unemployed were set tidying up the ground and were paid 9/6d each for two days work (ed: 47p, today, or approx £55, adjusted for inflation). The land will be useless for building purposes, as make good of this sort takes about ten years to settle down and become solid." This land is today partially occupied by Southern Road Primary school and the St Mary's allotments. 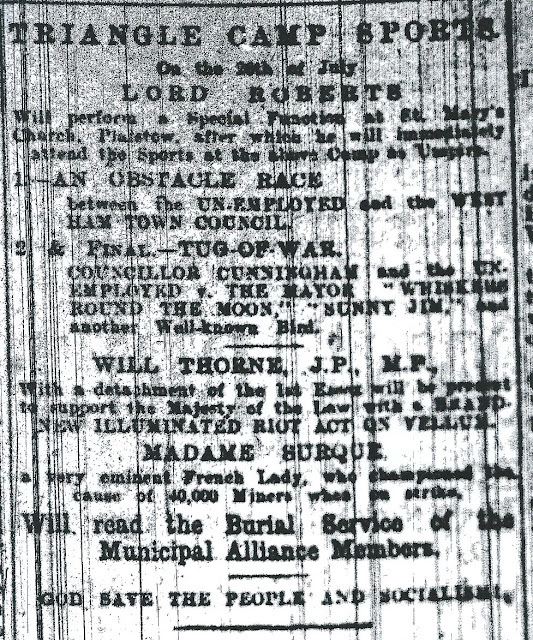 It had been the subject of an unsuccessful motion at West Ham Council urging the council to allow the local Unemployed Aid Society to have access to it, for allotment-type purposes, the night before the occupation. 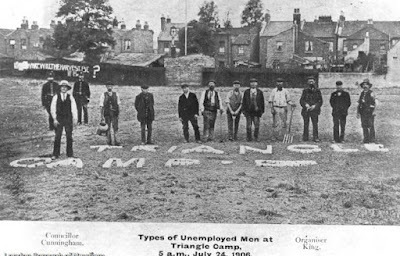 By the end of 13 July 1906, 20 unemployed workers were cultivating the land on the site, which was soon known as the Triangle Camp; by Monday, Savoy cabbages had been planted. The occupiers received thousands of young plants and seeds from supporters. Broccoli, and celery were soon added to the crops under cultivation. By the Tuesday most of the planting had been completed and the men busied themselves watering the dried ground. Donations, not just of plants - but food and money too - began to flow in, from well wishers. A Joseph Terrett donated a lamb, which the men dined on, accompanied by peas from another donor. (Terrett seems likely, according to Ancestry, to have been a 33-year old butcher, then living in Park Road, Plaistow). The same evening some of the men's wives joined the campers and entertainment was provided, via a mouth organ and a wind-up gramophone. Water supply proved to be a problem for the Land Grabbers, until someone discovered a disused well near the site. This was successfully reactivated, to such an extent that one of the campers was expelled from it for drinking "somewhat liberally" from it! Ben Cunningham was appointed "Captain" of the occupation and Bill King, "Minister of Agriculture". King decided the land should be divided into four triangular plots, and the site soon gained the name The Triangle Camp. A "headquarters" was established on the site, built from canvas and wooden poles, and was soon dubbed The Triangle Hotel. Managed by Cunningham, it provided over -night accommodation and dining space for the squatters/land-grabbers. A sign was erected, reading "You are requested not to spit on the floor of this hotel". The Plaistow Land-Grabbers at work. On the wall at the rear of the plot, someone had painted in large white letters "What Will The Harvest Be?" - see photo of the land-grabbers. Ben Cunningham told the Stratford Express that later someone had later added, perhaps intended tongue in cheek, but what turned out to be prophetic, the words "One month's hard". Collections were held to support the camp and its occupants, with one collector, 60-year old labourer, James Cleaver, arrested for begging. It seems likely, according to Ancestry, that he was a bricklayers' labourer, then living at Burnham Street, by the Victoria Docks. One of the occupiers, named Francis, turned an old cigar box into a collecting box and used the money donated by the curious and local supporters to buy bread and cheese for the Grabbers. The Land-Grabbers also received financial help from William Pooley, a local businessman, who became the leading figure in the “Back to the Land” campaign (see the second part of this post for a full consideration of his role). West Ham's mayor, Alderman Byford, wrote to Cunningham, telling him that, as a magistrate, he was going to take action against the illegal occupation. Cunningham wrote back: "With all due respect to your worship's opinion, I don't consider that I have acted illegally in taking possession of disused land which rightfully belongs to the people." On 26 July a large body of police accompanied council highways official George Blain to reclaim the land. Blain, himself, was not unsympathetic to the occupation and is said to have donated money to support them. 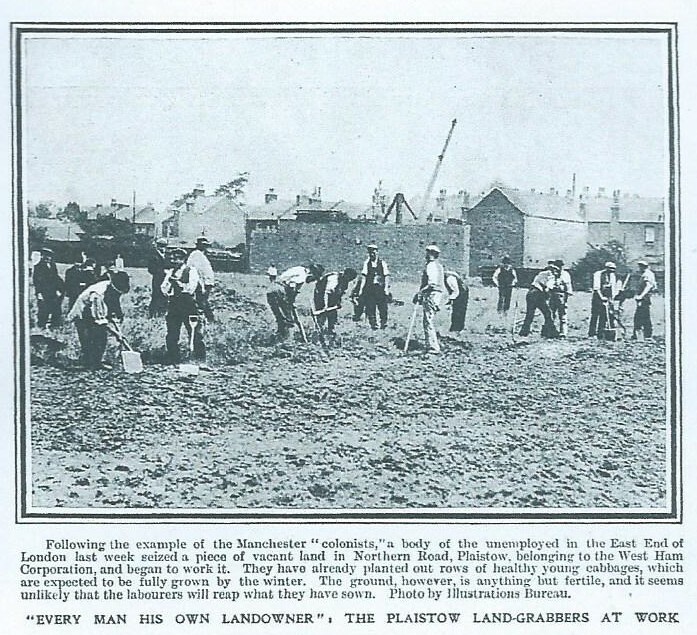 The Land Grabbers were encouraged by a crowd of between 3,000 and 5,000. The Western Times reported that "there was no disorder, and the utmost good feeling prevailed." Blain and company beat a strategic retreat. The crowd was addressed by French syndicalist Mde Sorgue and Tottenham SDF member Herbert Thomas, who supported the action and exhorted revolution. Others on the left, including local SDF MP, Will Thorne and luminaries such as George Bernard Shaw, however, distanced themselves from the occupation. Later in July Justice Bricknell granted the Mayor writs against the Land Grabbers and Blain returned to the camp, accompanied by several police, and began to clear it. Cunningham refused to go peacefully, and was carried off. The "hotel", which included the squatters bedding, was pulled down. Cunningham and others returned to the camp on 4 September, but were denied entry by up to 120 police and 30 council officials. Ben Cunningham was subsequently imprisoned for contempt of court and stayed in Brixton until he apologised for his actions, on 11 October. Two others were charged with offences connected to the 4 September return. George Pollard, a 35 year old gardener, from Plaistow was accused of assaulting George Blain. He refused to take his hat off when he appeared in court and the police removed it for him. He told the court he was an anarchist-communist and had been looking for work from morning until night, without success. He had six children and told the court he could not get relief payments from the council, saying: "While we have capitalists, be they Christian or otherwise, we are bound to have distress." Pollard was sentenced to six weeks, with hard labour (oh - the irony, work at last!). Thomas Evans was charged with assaulting Alfred Thomas Taylor, a West Ham Council official on 4 September and was fined twenty shillings, or 14 days imprisonment in default of payment. The magazine, Literary Review, reported on the "anarchist heroes", commenting: "These are the kind of heroes who are supposed by numerous sentimental dreamers in this country to be heralding the social revolution." Although notionally "defeated" in their attempts to relieve distress through the Triangle Camp, the Land Grabbers did not quietly fade away - but provided inspiration for a new movement - see the next post. Ben Cunningham was disowned by the SDF for his actions and was de-selected as its candidate for council election. He stood as an independent and came a poor third in the election later that year - apparently never again surfacing in formal local politics. The extent of the scourge of unemployment in the area at the time was illustrated by the fact that over 1,000 local residents emigrated to Canada and New Zealand, the following year - on government advice. 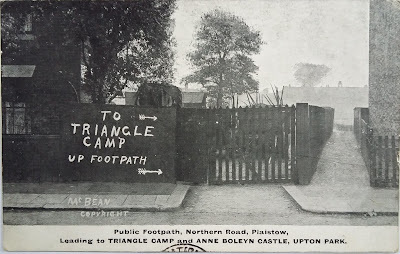 The area of Triangle Camp, itself, was approved by West Ham Council to become council allotments, in 1910, after the Labour Group had taken control of the council. We visited the site, now known as the St Mary's allotment site, recently and it remains a successful, thriving allotment site. There are around 130 plots on the site, with a waiting list of the same number again. It is the most popular in Newham, because of its position. Also, somewhat surprisingly because of the richness of its soil. Given the fact that the Land Grabbers moved onto essentially a council dump, the rich state of the soil today is a testament to the hard work put in by a century of allotmenteers. The plot holders are very diverse - almost mirroring the racial composition of the borough. Those with South Asian and Caribbean heritage have done a fine job in cultivating crops from their countries of heritage and origin. So, a fine array of squashes, together with pumpkin and okra are to be found, among many other crops unfamiliar to the traditional English garden. There are schools on three sides of the allotments: Southern Road Primary, Plaistow Primary and Lister Secondary. There was an open day when we visited and over 50 people attended, the main scene of the activity took place on the position of the Triangle Hotel - see photo below. The allotments are run by a committee, featuring the very convivial Elaine and Kevin Fieldhouse. Footnote We are indebted to Nick Heath from the www.LibCom.org blog and Neil Fraser, author of Over the Border: the Other East End, Function Books, pub 2012 £9.99 for much of the information in this article. Other sources include Ancestry.com and the www.britishnewspaperarchive.co.uk. Fascinating story and brings to life swathes of common people or rather, men.